Chris Anderson is the curator of TED Talks and he gives an outstanding interview on the radio program called “On Point Radio” about his job in this role. For those of you unfamiliar, TED stands for Technology, Entertainment and Design, and the talks are a maximum of 18 minutes long on various topics. You can imagine trying to get some of these broad thinkers to distill their ideas down to this period of time. TED’s mission statement begins: “We believe passionately in the power of ideas to change attitudes, lives and ultimately, the world. So we’re building here a clearinghouse that offers free knowledge and inspiration from the world’s most inspired thinkers, and also a community of curious souls to engage with ideas and each other.” There are over 850 available for free on-line including talks by Jane Goodall, Melinda Gates, Sunitha Krishnar, Kiran Bedi, Sir Ken Robinson, Steve Jobs, Sherwin Nulan, and Lewis Pugh. This interview with Mr. Anderson features some behind the scene stories and highlights from some of his favorite talks. These are outstanding presentations and his insights make for a lively program worth a listen. 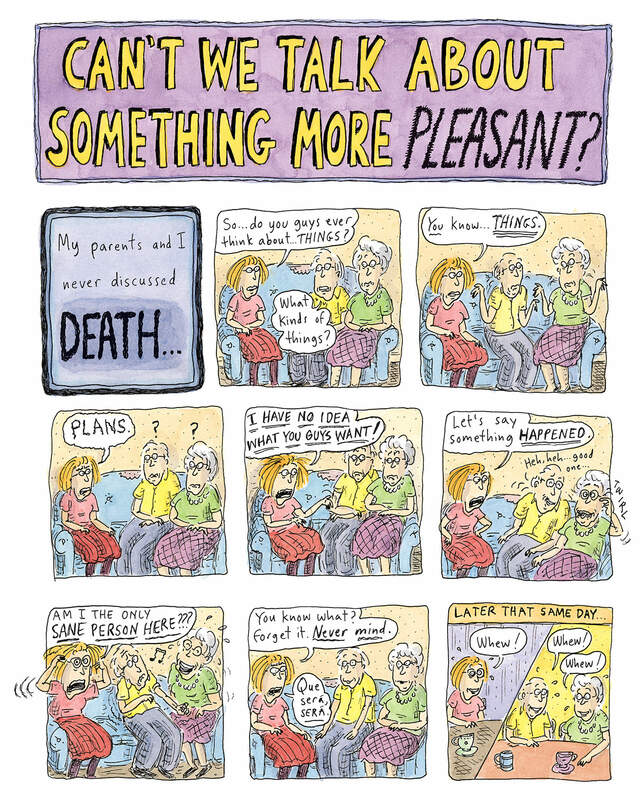 If like me and you smile when opening your The New Yorker and seeing one of Roz Chast’s cartoons you must read her book Can’t We Talk About Something More Pleasant. 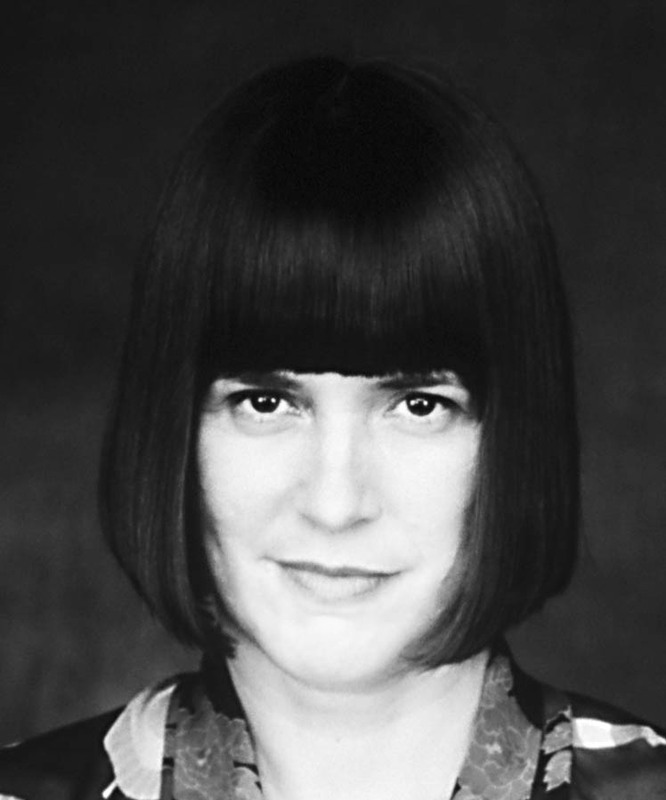 She has appeared on those pages since 1978 and focused primarily on domestic topics. This book is a cartoon memoir that candidly capture her experience seeing to her parent’s needs at the end of their lives. 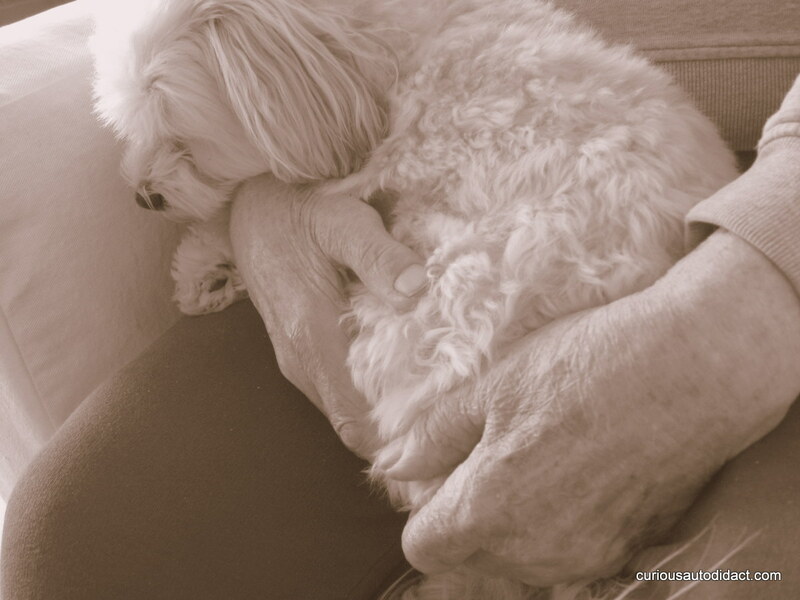 She is an only child, they have lived in the same New York apartment she grew up in. It is an amazing book, all I could think about was her reliving all these things as she got about halfway into this artistic project and what it was like to read this one of kind terrific book. If you aren’t yet convinced listen to her on KQED’s radio segment. 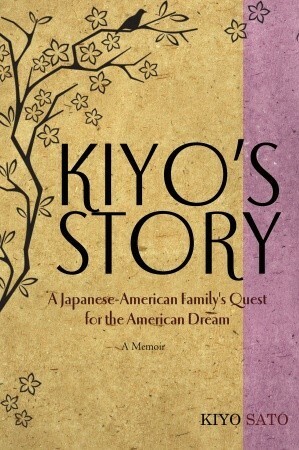 I heard a podcast of Kiyo Sato talking about her book Kiyo’s Story: A Japanese-American Family’s Quest for the American Dream, and she sounded so young telling her family’s story I couldn’t believe she was a senior citizen. Her talk was lively and candid. She told of how she did presentations to school children so that this ugly piece of American history will not be forgotten. Her book is highly recommend. If like you this book gets you more curious about the history surrounding Executive Order 9066 exploring it further using the many on-line resources about the WWII Internment of 120,000 Japanese-Americans including this annotated list of materials. There’s a digital archive of photos out of University of California that are amazing to browse. Here’s recent radio show from NPR’s affiliate KUOW featuring stories from internment in Minidoka. Densho, a Japanese term meaning: “to pass on to the next generation,” or to leave a legacy. This extensive project includes 500 hours of oral history and over 8000 visual images. Check it out and learn what this experience was like for so many law-abiding citizens whose stories should be honored and remembered. Issei: First generation Japanese immigrants to America. Federal law prevented them from becoming naturalized citizens until 1952. Nisei: Second generation, born in the U.S. and citizens by birth. There are so many great things to list to in the podcast category for free through I-Tunes or on the web. These are great to listen to while driving, doing housework, or even while updating your blog. If you aren’t a regular listen to KQED radio’s program FORUM in San Francisco you may well become a regular listener once you hear one of the outstanding programs. One that struck my fancy of late was on called Why Books Matter an interview with LA Times book critic David Ulin about his book The Lost Art of Reading. 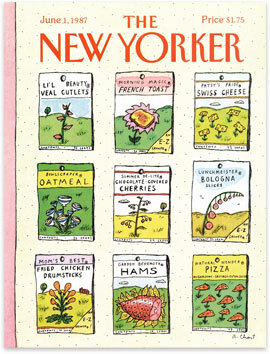 If you are a fan of reading this program will tickle your fancy. If reading interests you the Thomas Jefferson Hour‘s program on Education#839 is a must-listen. Clay Jenkinson’s program in character as Thomas Jefferson is usually outstanding but this was one i sent to several friends who are teachers. It got us to sit down after dinner and write down as many countries in Africa we could each recall, indeed an interesting exercise. We studied the atlas to find out which we missed and did it again the next night, it’s a good brain stretch and certainly proves Jenkinson’s point about American’s limited knowledge of geography especially the continent of Africa. Ms. Ensler has taught on the college level. She takes these well honed teaching skills into New York’s Bedford Hills Correctional Facility, to encourage women inmates to explore their inner feelings through the written word. This documentary “What I Want My Words To Do To You” takes you inside these classes and into the world few are privy to, in a film that is sure to inspire.This portrait of fifteen women prisoners, and their experiences in this writing workshop, is powerful viewing. Their writings are later performed before fellow prisoners by actresses Mary Alice, Zoe Caldwell, Glenn Close, Ruby Dee, Hazelle Goodman, Marybeth Hurt, Phylicia Rashad, Rosie Perez, and Marisa Tomei. This group of actresses has generously donated their time and talent to performances in various venues these written works, some of which have raised significant funds for the prison’s college education program. This documentary was recommended by a friend and recently became available through Netflix having been previously featured on the PBS Point of View series for independent films some years back. There is a teaching guide on their site and viewers are encouraged to use the film to spark community dialogue about the topics in this thoughtful film. One person can make a difference. What have you done today to make someone’s life better? 1. Talk about funerals with family members ahead of time so they all will know your wishes and you will know theirs. If your plans are mentioned only in a will, the will may not be read until long after other ar-rangements have been made. If Mom had always said she wanted something “simple” and you aren’t sure what she meant, you may end up purchasing a great deal more than something truly “simple.” Or perhaps Mom told everyone what kind of funeral she wanted, but she had no idea that it would cost far more than anyone could afford. 2. Price shop by phone or in person. Price-shopping can save you thousands of dollars. The funeral home in your neighborhood may be three times as expensive as one across town. Many of these price lists are now available on-line. By law, funeral homes have to give you prices over the phone, or hand you a General Price List (GPL) when you start talking about prices at the funeral home. If the GPL shows that caskets begin at $595, did you ask to see one if it was not on display? 4. Make your own or buy online. You can find caskets or kits on-line for a fraction of the retail price. It is illegal for a mortuary to charge a “handling fee” for using a casket obtained elsewhere. Or, choose a “minimum container” from the mortuary and drape it with attractive material, a handmade quilt, or a flag. Most people know what’s involved in growing a head of lettuce or a few tomatoes and would think $10 each was an outrageous price; they probably would stop buying them. Few consumers realize that caskets may be marked up 300500% or more. A casket that is listed for $1,295 at the funeral home might wholesale for only $325. That same casket is probably available from a casket retailer for $650. 5. 5. Consider the “direct burial” or “immediate cremation” packages. These plans do not necessitate buying grand caskets, embalming, cosmetic touchups, or funeral services and processions. Cemetery space for cremated remains is generally – but not always – less expensive than the space needed for a body burial. Cremated remains can be buried/scattered almost wherever you choose. Also, if you choose one of these options, you don’t need to use a local funeral home which might cost twice as much as the one in the next town. 6. Plan a memorial service without the body present. In that case, there would be no need for embalming, a fancy casket, or expensive transporting of the body back and forth. Private family visitation and “goodbyes” can occur in the hospital or home, before you call a funeral director. Use a church, park, or community center for the memorial service without attending funeral home staff. Again, with this option, you do not have to use a local funeral home. .
7. Skip embalming. Embalming is not routinely required by law. Some circumstances may precipitate the need for embalming, but in no state is it necessary when burial or cremation is planned within a day or so. 8. Consider body donation to a medical school. In some areas, there may be no cost to the family whatsoever. In other circumstances, the cost of transporting the body may be the only cost. Generally cremated remains are returned to the family within a year or two. 9. Some cemeteries may require a grave liner or vault, but not all. There is no state law that does. If you prefer body burial, ask for a “grave liner” rather than a “coffin vault” at a fraction of the price. And again, be sure to shop around. The “outer burial container” is a way for morticians to increase their income and is an added burden on your funeral finances. With prices as much or more than caskets, remember that it is just a boxforthebox which gets quickly covered by the cemetery lawn. 10. Consider handling all arrangements without using a mortuary. Most people also don’t know that in the majority of states a family or church group may handle a death without the use of a funeral home and many families have found it loving and therapeutic. The book, Caring for the Dead: Your Final Act of Love, gives a great deal of state specific practical information, and the PBS documentary, A Family Undertaking follows the stories of several families. Both are invaluable resources for anyone choosing this meaningful way to say goodbye. And, a bonus tip: Join your local Funeral Consumers Alliance. Some have contracts with local funeral homes for services at a reduced price for members. Some have done a price survey and have done the priceshopping for you already. Most will refer you to an ethical funeral home. There are reciprocal benefits if you move to or die in another state. Supporting an Alliance will help to keep this consumer information available for future generations, and the membership contribution is modest. Remember: Funeral directors are business people who deserve to be paid for what they do. However, it is your job, as a funeral consumer, to be well educated about your funeral choices, to determine the kind of funeral or memorial service that meets the needs of your family, and to locate an ethically priced facility that will honor your choices with dignity.